Shoppers in Newport News’ Southeast Community are finding an abundance of fresh fruits, crisp vegetables and choice meats at Jim’s Local Market. But just as important, the grocery store is providing jobs plus nutritional and financial guidance to residents of the economically depressed neighborhood, helping to boost their community pride. Bayport Credit Union has a branch in the store, giving many residents their first access to banking services, and it will offer financial literacy classes in the store’s community room. Bon Secours Virginia Health System meanwhile is teaming up with the store to promote good nutrition. Eighty to 85 percent of the store’s employees live in the Southeast Community. Florence Kingston, Newport News’ economic development director, says those added touches are important to the city’s efforts to revitalize a neighborhood where the unemployment rate hovers around 20 percent and half of the residents live below the poverty line. “It’s using resources to build the social capital of the residents in the community,” Kingston says. Opened in May, Jim’s Local Market ends a period of nearly two years during which the Southeast Community had no full-service grocery, designating the neighborhood as a “food desert,” an area where affordable, nutritious food is difficult to obtain. Former grocery store executive Jim Scanlon came up with the idea for the market as a way to provide healthy, affordable groceries to areas with limited food access. Scanlon spent four decades in the industry, including a stint running an inner-city store in Albany, N.Y., before retiring as regional vice president for Martin’s Food Markets in Richmond. “Newport News was one of the few municipalities that came to the plate early on in recognizing the issue with food access,” he says. “They came to me to put a solution together to provide fresher, high-quality products that people can purchase locally.” Scanlon next plans to open stores in food deserts in Richmond and Hampton. Newport News’ Economic Development Authority owns the building, leasing it to Scanlon, who’s gradually building a clientele. “It’s been a little slow out of the gate, but it’s growing every day. It’s just a matter of getting people’s habits changed,” he says. 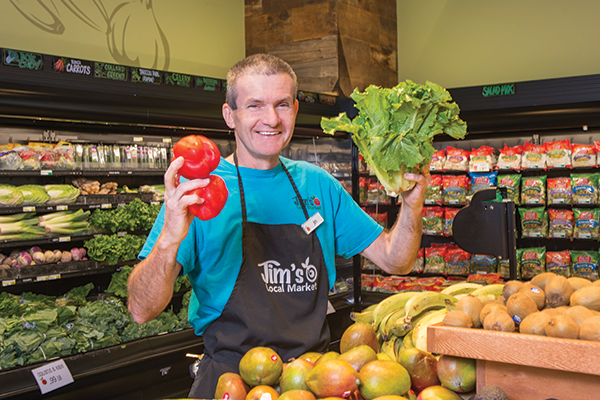 Jim’s Local Market anchors the shopping center in the mixed-use Brooks Crossing development, a revitalization endeavor encompassing the Southeast Community. The city is investing up to $18.3 million in the development, which is a partnership between Aaron Brooks, a former NFL quarterback who is a Newport News native, and Virginia Beach-based developer Armada Hoffler. Newport News bills itself as the center of business, retail, technology and transportation for the Peninsula, a strip of land with 600,000 residents, bounded by the Chesapeake Bay, Hampton Roads and the York and James rivers. “There’s more innovation going on in Newport News than people are aware of,” Kingston says. She points to the reinvigorated City Center at Oyster Point, the new Tech Center mixed-used development, expansion at Newport News Shipbuilding and the long-awaited widening of Interstate 64. All are touted as a much-needed economic jolt for the city and its 183,000 residents. 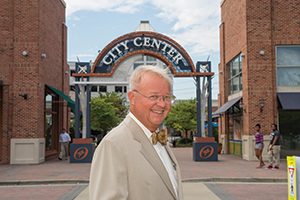 Pointe Hope, a local investment group led by former Newport News Mayor Joseph C. Ritchie and Hampton attorney Robert E. Long, this summer closed a $64 million deal to purchase nine buildings in City Center. Under out-of-town investors, the mixed-use development never lived up to city leaders’ vision as the center of Newport News. “This group has a better handle on the pulse of what’s going on in the community and will take City Center to where it needs to be,” Ramey says. 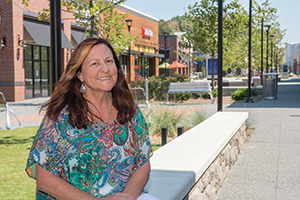 At the nearby Tech Center, national retailers, such as Mellow Mushroom and Whole Foods Market, are staking their claim on the Peninsula. The retail phase is complete, the first phase of upscale apartments are set to open this fall, and construction is expected to start on the signature research park early next year. Set on 50 acres adjacent to the Thomas Jefferson National Accelerator Facility, the center will give high-tech companies a place to perform advanced research. The Jefferson Lab is one of only two facilities in the running for a $1 billion electron-ion collider, a U.S. Department of Energy research facility that the city expects would have a $4 billion economic impact on the region. A collider is used by researchers to understand what lies inside a nucleus and what holds it together. A decision on the site is expected within the next three years. Newport News’ advanced machinery corridor is also growing with the expansions of Canon Virginia Inc., Continental Corp. and Liebherr Mining Equipment. Virginia’s largest industrial employer, Newport News Shipbuilding, plans to add 1,000 jobs, along with new facilities and equipment to enhance construction on aircraft carriers and Virginia-class submarines. Newport News City Council agreed to provide up to $46 million to help the shipbuilder fund the $750 million investment in new facilities and equipment. The General Assembly approved similar funding during the last legislative session. “That’s really a very strategic investment by the shipyard that will carry it for generations to come,” Kingston says. New jobs and expanded facilities are also on tap for Newport News Industrial Corp., which like Newport News Shipbuilding is a subsidiary of city-based Huntington Ingalls Industries. The 50-year-old company is adding 52,000 square feet of production space at its Oakland Industrial Park site to supply steel modules for nuclear power plants manufacturer Westinghouse. Newport News Industrial now employs about 400 workers but will hire about 125 additional welders, inspectors and quality assurance personnel starting in early next year. Another major Newport News employer, Ferguson Enterprises Inc., continues to grow. In fiscal year 2016, it bought 13 companies in markets that showed high potential or where the company had limited presence. Ferguson, which has annual revenue of $13 billion, employs 22,000 people, including 2,500 in Virginia. New businesses and corporate expansions require highly skilled workers, a need Newport News Public Schools strives to meet through the district’s Career Pathways program, which introduces students as young as kindergartners to a variety of careers. Students learn about job fields throughout elementary and middle school. The program culminates in high school with job shadowing or hands-on training in areas such as architecture and construction, arts, education, government, health science, aviation, business, and audio-visual technology and communication. Career fields are selected based on student interest and regional job needs.